The eye is a sensory organ. It absorbs light rays from our environment and transforms them in such a way that the information in the brain can be processed further. The eye and brain form a unit that has developed together in the course of evolution (visual system). The process of processing is called "seeing","watching" or "looking". The visual impression is essentially generated from visual memory, in which only little new information from the eye is incorporated. The human eye is a spherical body, also known as the eyeball. It lies in the eye socket and is "attached"to various muscles. With the help of the eye muscles, the eyeball can be turned in different directions ("look out of the eye wraps"). The front side of the eye is the cornea. 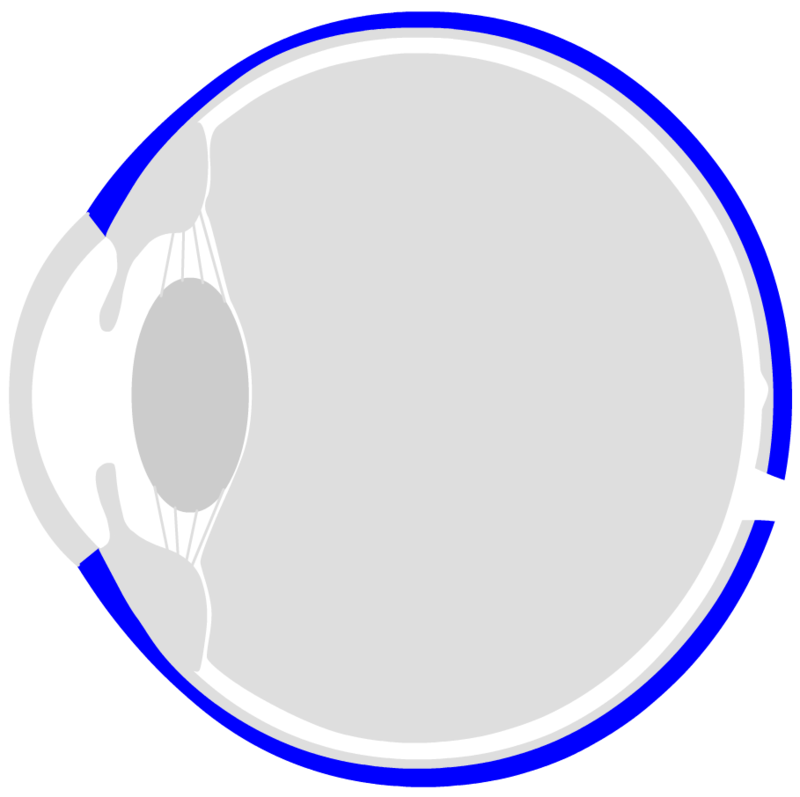 The cornea is transparent and consists of six layers. The ring-shaped transition from the cornea to the sclera is called limbus (from Latin for "border"). With the help of the stem cells located there, the cornea is permanently renewed. It is slightly thinner in the centre than the outer areas. This is especially important in the case of eye lasers, when a part of the cornea is removed in order to optimize the refractive power. 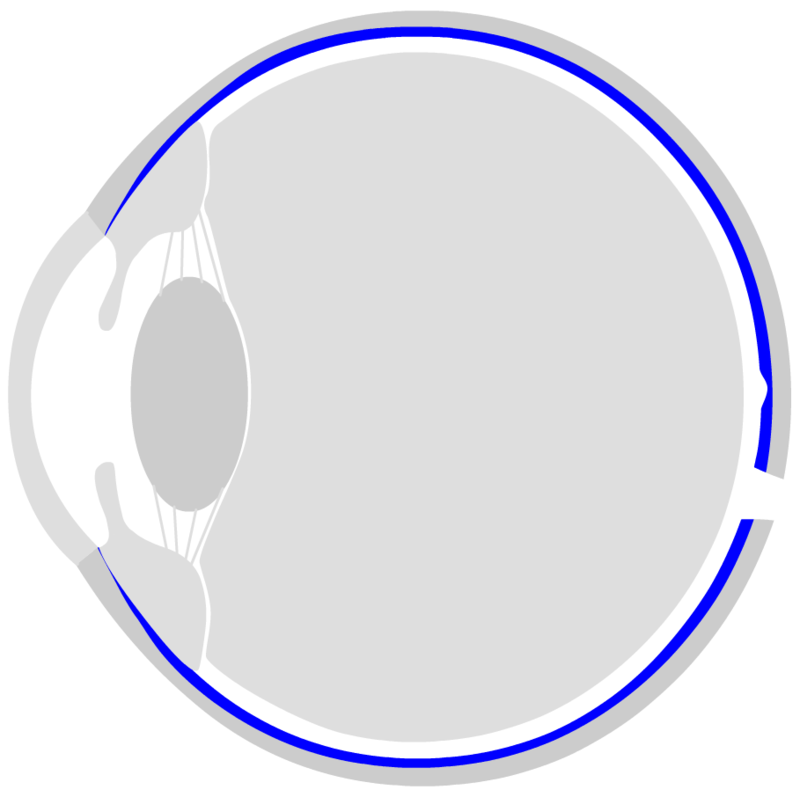 The curvature of the cornea refracts the light by about 45 dioptres. The cornea is covered with tear fluid, which is formed in the tear glands and serves to supply and protect the eye. Behind the cornea is the anterior eye chamber, which is filled with intraocular fluid. It contains nutrients to supplie the eye lens and cornea. In addition, immune factors are floating in intraocular fluid, which serve to render potentially damaging foreign bodies and germs harmless. It also helps to maintain a constant intraocular pressure. Behind the iris the posterior chamber of the eye begins. 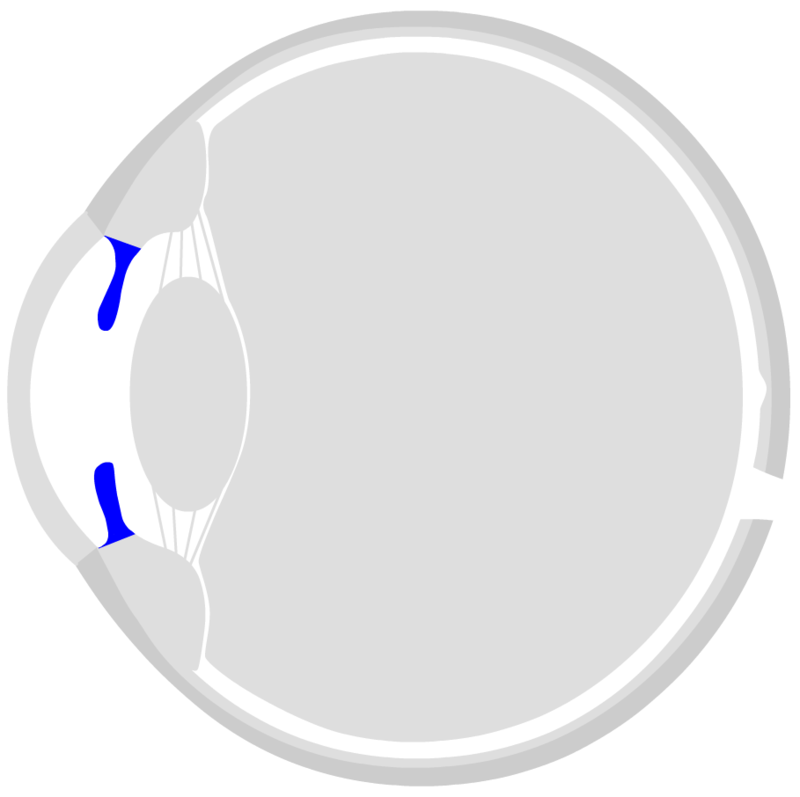 The intraocular fluid is produced and released at the ciliary processes. It then slowly flows through the pupil into the anterior chamber of the eye. The iris is located in the center of the cornea. It consists of many fine muscle pathways that can contract or expand. 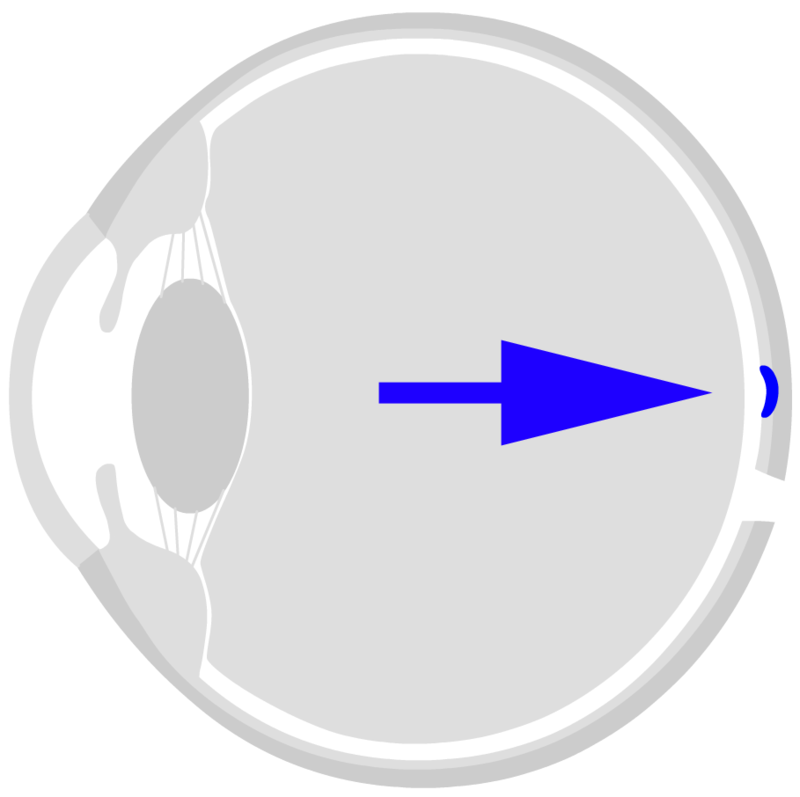 The resulting round opening in the center is called the pupil. The darker it is, the more light is needed for vision - the pupil becomes correspondingly larger in darkness. In very bright light, the pupil is only small. The iris is (except for so-called albinos) coloured by certain pigments (blue, brown, green, grey or corresponding mixed values). Behind the pupil is the eye lens (Phakos). It is responsible for about 15 dioptres of the refractive power, but it can change its refractive power. Thanks to this ability (so-called accommodation), the eye can see sharply both near and far. The eye lens is a kind of liquid sphere. They can be compared to a water-filled balloon. In the middle - on the so-called lens equator - the lens is hung up on the zonula fibres, which originate from the ciliary muscle. The lens fluid solidifies over the decades. It is thus the cause of widespread presbyopia. In addition, protein structures in the lens of the eye increasingly clump together over time, clouding the image. This deterioration in visual quality is also known as cataract. Often, the old lens is removed during cataract surgery and an artificial lens is simply inserted - which ensures a clear view even in old age. 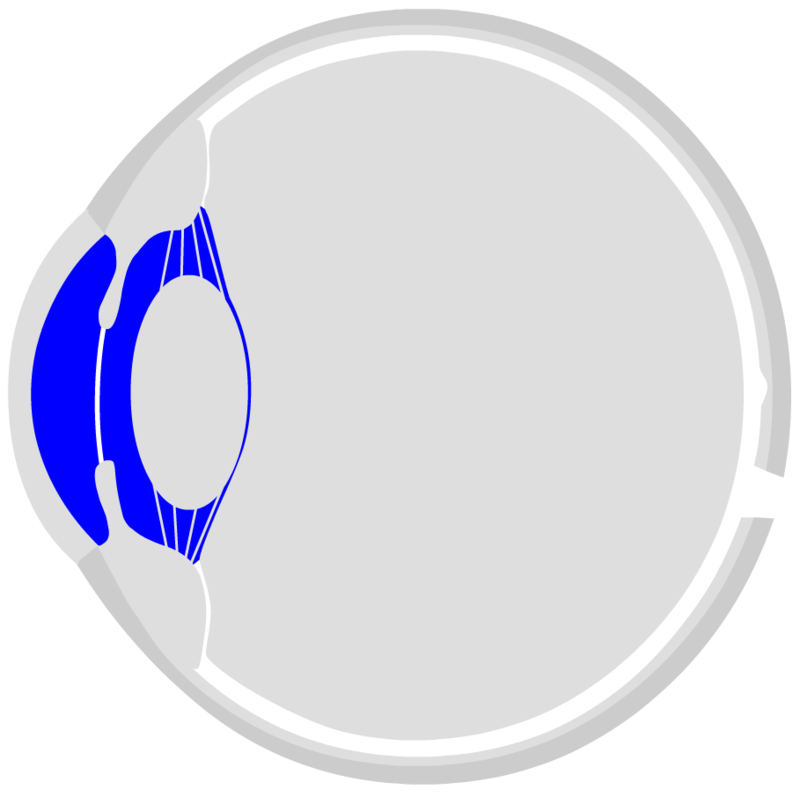 The ciliary muscle is located behind the cornea in a ring-shaped shape inside the eye. It can actively influence the curvature of the eye lens. In a relaxed state, the lens is flat and drawn out - so you can see well in the distance. 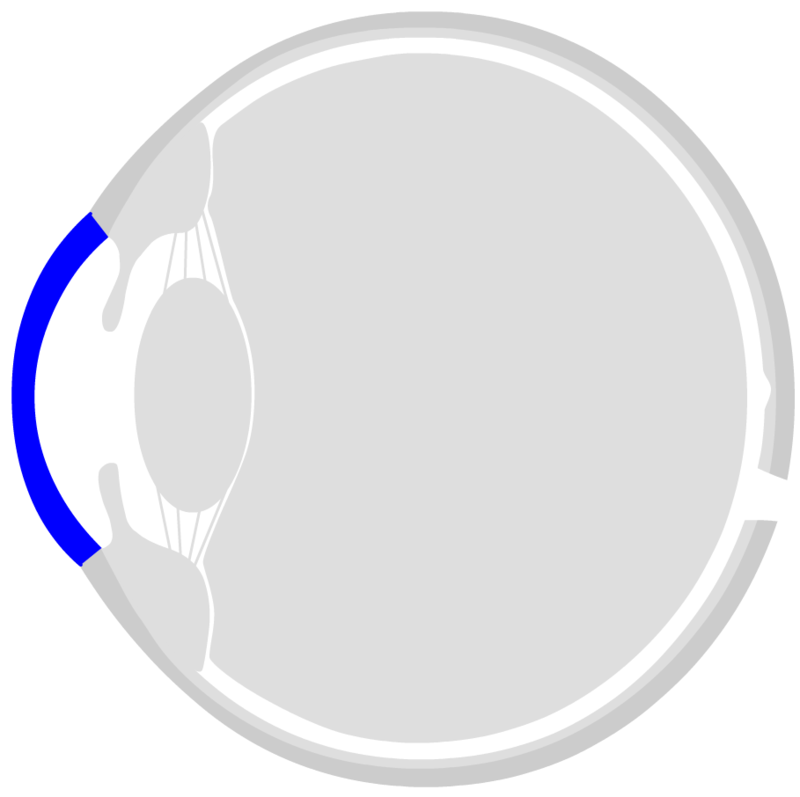 However, if the ciliary muscle tightens (contract tone), the diameter of the ring becomes smaller. The zonula fibres relax and the lens takes on a rather bulbous, spherical shape. This changes the refractive power of the lens so that you can see well in the vicinity. This process is called accommodation. 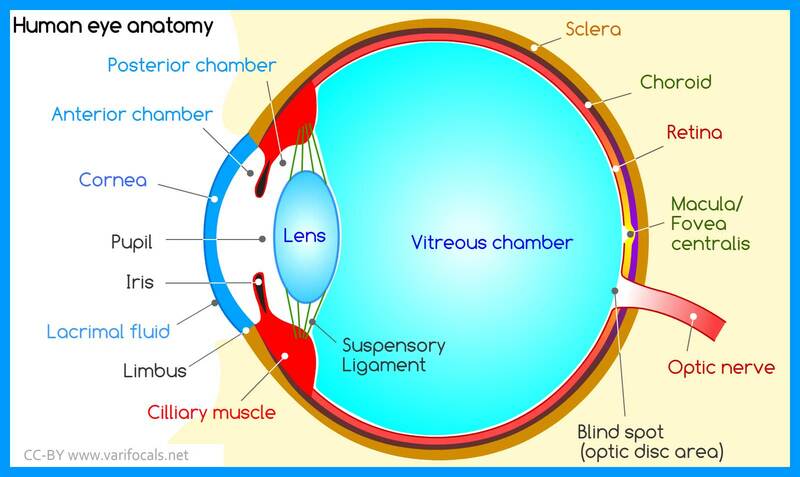 The inner space of the eyeball is filled by the vitreous body. It consists of a gel-like clear liquid and is especially important for the stability of the eyeball: the liquid generates a pressure, the so-called intraocular pressure. This ensures that the surrounding layers do not peel off and collapse. In addition, without intraocular pressure, the eye would be much more sensitive to external pressure influences that affect the cornea from the outside. An abnormal intraocular pressure is the cause of many eye diseases, such as glaucoma. All components through which the rays of light pass before they hit the retina have a dioptric effect. They are also called dioptric apparatus. 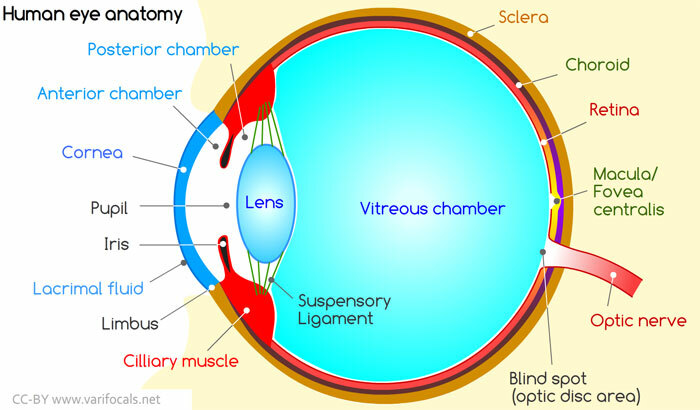 The aqueous humor and the vitreous body are ideally almost transparent, so that there is hardly any measurable refraction of individual photons. 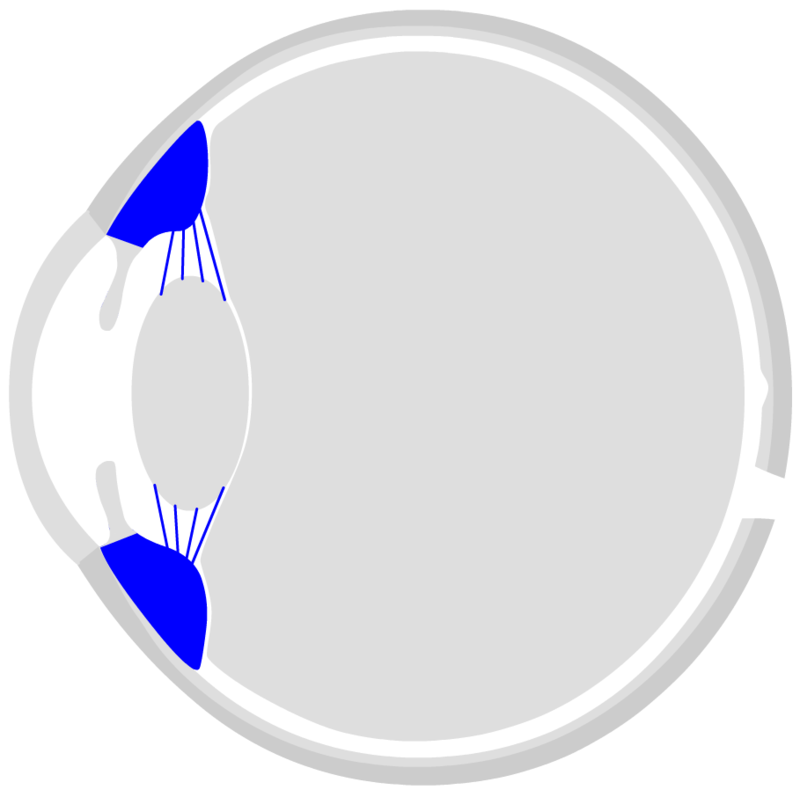 The cornea and eye lens are responsible for the actual dioptric effect. The entire eye has a refractive power of approx. 59 dioptres (dpt), of which approx. 43 dpt (75%) is on the cornea and approx. 19 dpt (25%) on the eye lens (in a relaxed, non-accommodated state). The eyeball is surrounded by three layers. The outer shell is called sclera. The dermis has a whitish colour - in the front, open part of the eye you can see it well. It encloses the eyeball almost completely and protects the eye. The dermis is interrupted only in two places: in the front by the circular, transparent cornea (Cornea) and in the back of the eye by the optic nerve coming from the inside of the eye. Inside the protective sclera follows the choroid, which, as the name suggests, is permeated by numerous blood vessels and capillaries. 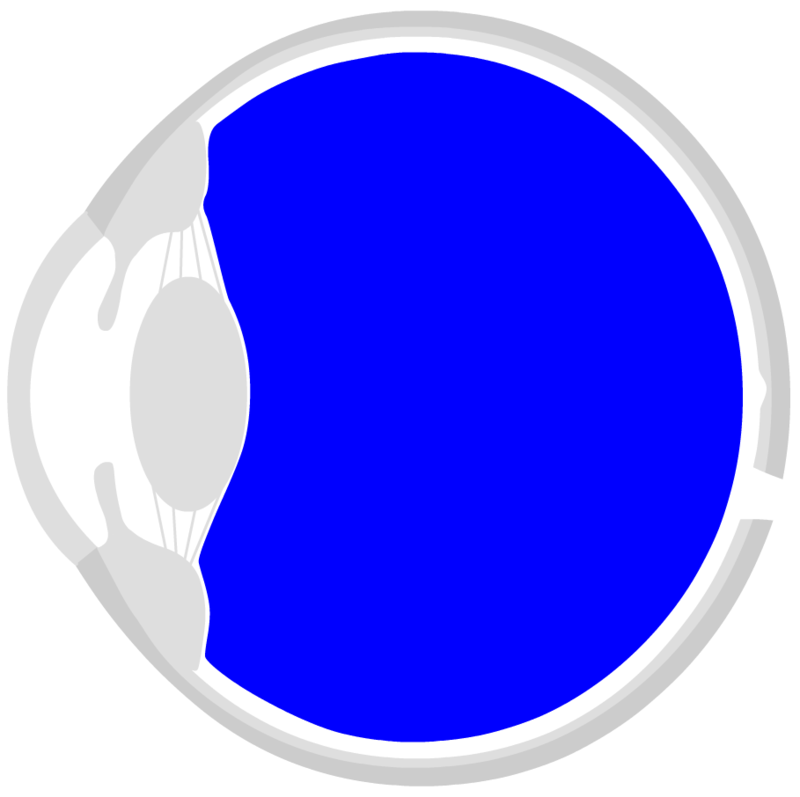 The blood supplies the retina with nutrients and oxygen. The choroid is dark pigmented and ensures that unprocessed light is absorbed (instead of being reflected into the inside of the eye). The effect of the "red eyes on photos" is related to this: the flash is so intense that it brightens up the inner eye. The red blood vessels of the choroid are then visible in the photo. 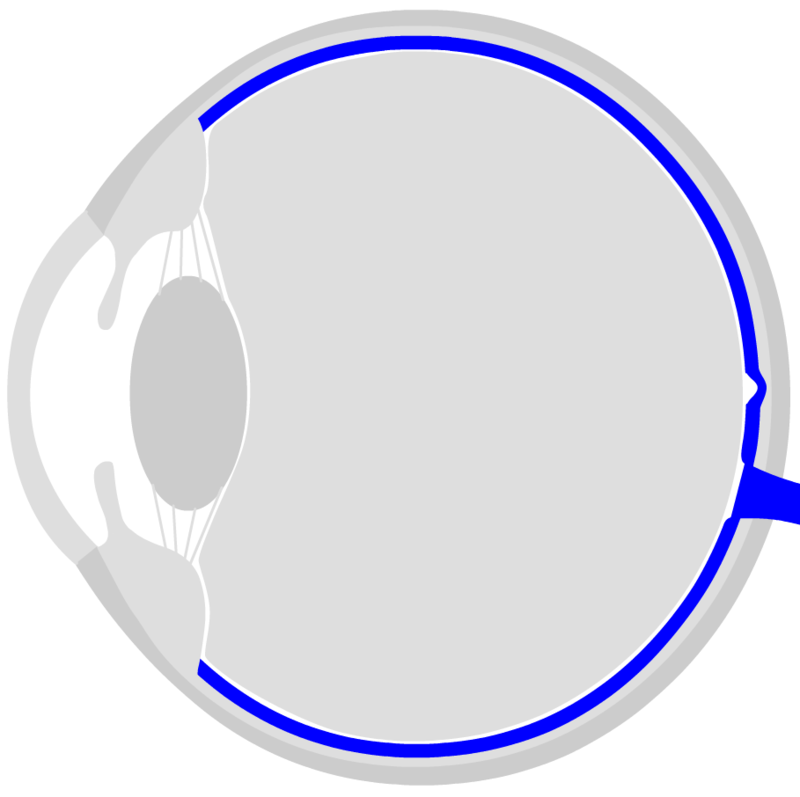 The retina is located on the back / inside of the eye. It consists of different cell layers: the photoreceptors (sticks for chiaroscopy, cones for color vision) convert the light impulse into an electrical nerve impulse. The light information is bundled in so-called receptive fields, amplified and transmitted to the brain via the visual verve (visual pathway). The three cone types each react to light of different wavelengths. If a photon with a wavelength in the red region hits a red cone, then it "fires" an impulse at the following cells. The other two cone types remain inactive for a "red photon" (at least statistically seen). They react accordingly when photons arrive with their specific wavelength. 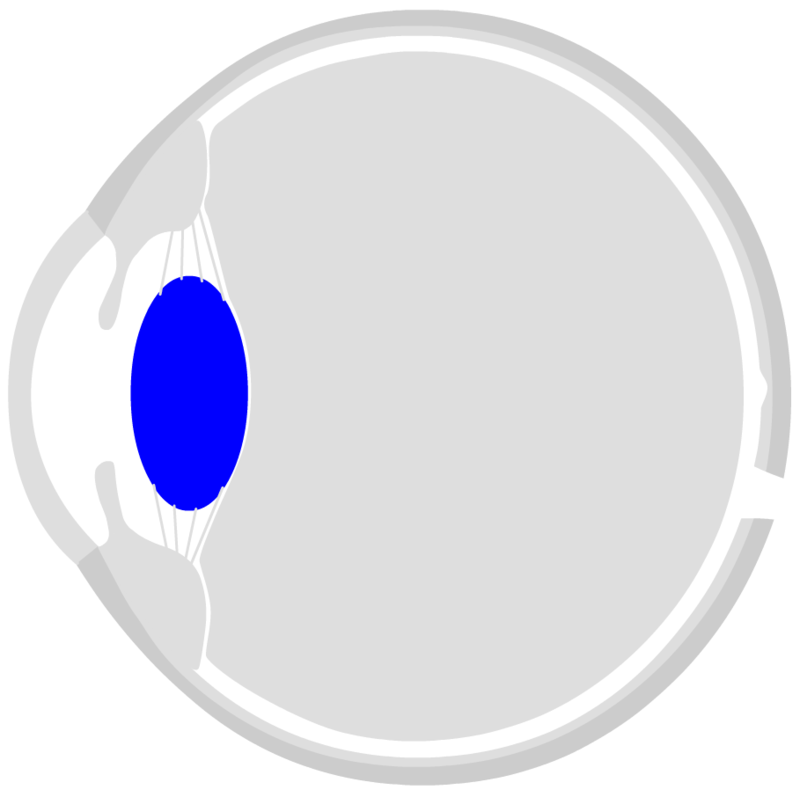 The retina consists of a large number of other cells that process the electrical impulses sent by the visual cells. The visual information from adjacent regions is bundled, compared and enhanced in contrast. Roughly speaking, it can be said that only "new" and "relevant" information from the "image" is passed on to the brain. Many interesting optical illusions are based on the processing of visual information in the retina. This "filtering" of information is very effective and economical. Evolution has developed the eye in such a way that it consumes as little energy as possible. Logically, you don't have to see everything to survive, but only what is important. The pre-structured optical information is then transmitted to the brain via the optic nerve. The information is collected from the left and right eye and forwarded together. This is where the so-called "stereoscopic vision"is created. 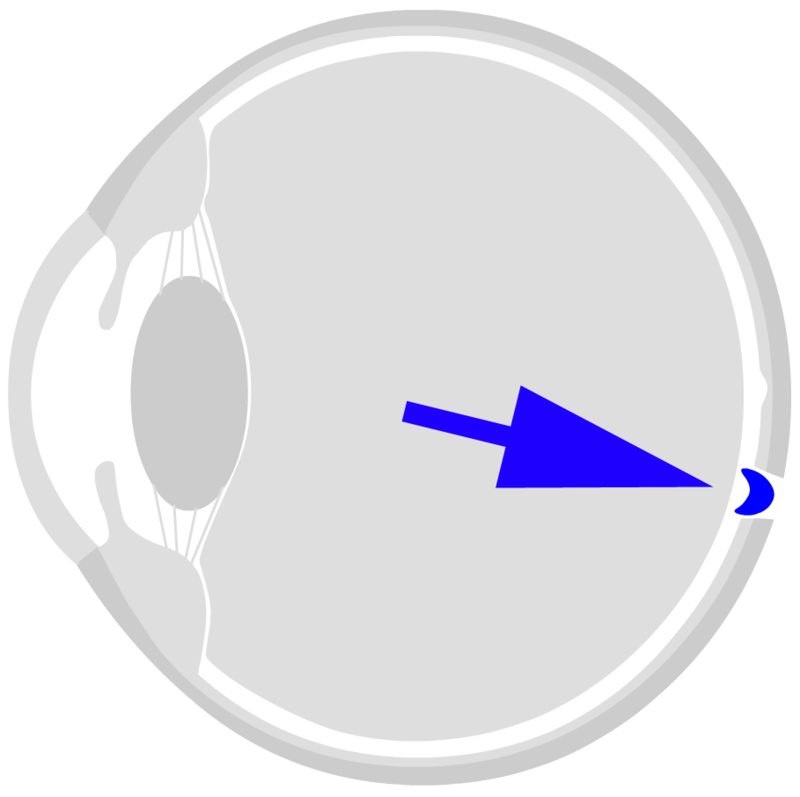 The information from the left and right eye is slightly different, since the angle of incidence is slightly different. From this difference, the brain can infer something like space. The spatial visual impression is thus created from the different information of the two eyes. Correctly, however, one has to say that the learned information such as perspective, proportions and so on have a greater share of the three-dimensional visual impression than stereoscopic vision. Interesting: the image is turned over by the lens or mirrored point-shaped. At the end, it is displayed on the head and inverted on the retina. But of course there is no need for "translation": the information on the retina is naturally processed and interpreted by the brain in such a way that we recognize the image of the world "correctly around". The area where the light information is concentrated on the retina is the area of "sharpest vision". It is called macula (yellow spot). Here, the photoreceptors are particularly densely packed. Practically all refractive errors (short-sightedness, long-sightedness, astigmatism and presbyopia) are based on the fact that the bundled light rays are not focused exactly on the macula. But: All these defective vision problems can be compensated by visual aids, i. e. optically correcting lenses. The nerve endings of the approximately 1 million ganglion cells must leave the retina in one place and lead as an optic nerve into the brain. This position is slightly below the macula and slightly inward (towards the nose). It is called a blind spot because there are no photoreceptors in the area - therefore, everything projected into the region cannot be seen. Everything depicted in this area is "invisible". Thus, in a small part of the field of vision, one is virtually blind. From a philosophical point of view, it is not that the eye reflects our surroundings inside the brain. There is no "one to one" translation. Instead, the eye interprets the visual information and groups and sorts it according to certain fixed principles. What arrives in the brain or is then deposited in the brain as a widely branched neuronal pattern is not "reality", but our interpretation of the reality preprocessed by the eye. In other words, the eye can only see what it has been designed for in the course of evolution. Try to imagine that the image they have in front of their eyes will be depicted in their eyes. Impossible, isn't it?